If you are serious about drawing & painting, there's no better way to lay a thorough step-by-step foundation than with Jan Bower's new 36 lesson video course Drawing Success. This is professional training for the serious art student. ﻿ “This is the best drawing program I’ve ever used,” announced my 14-year-old son. This teen loves art, and that is an area where I feel completely incompetent. 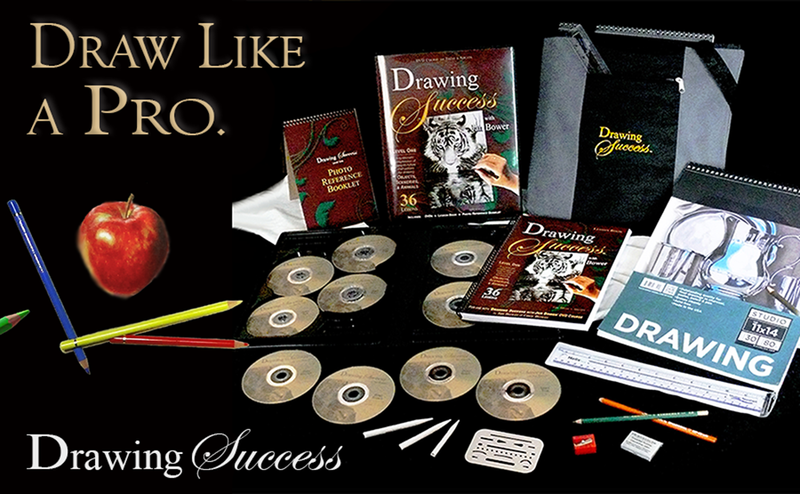 We’ve tried a few things over the years, and have found a winner with the Drawing Success with Jan Bower DVD Course. This set includes ten DVDs with over eighteen hours of instruction, a lesson book, and a photo reference book. If you are using this with multiple students, each student needs their own copy of the two books. The instruction included is spread over 36 lessons, so the course can be a year-long art class, which is what we’ve chosen to do, or you can double up and do it in a semester. Retail price is $189.99, which is just over $5 per lesson. I don’t know anywhere that I can find professionally taught art lessons for anything near that. Given that I can use this with all of my kids, and each can pause, rewind, and rewatch, this is an even greater value. Intended for teens and adults, this makes a great self-study course. What I’m finding though is that for a motivated younger child, a 9-year-old in our case, it is easy to adapt and make it work. I just need to be sure to be present for the DVD session, to be sure she is grasping what she is to work on, and to stay nearby as she draws. The lessons start out with very basic information. The first lesson covers how to hold your pencil and has you sketching circles. I will tell you that my son rolled his eyes at this and had quite the attitude. He really thought he was too good for it, but a statement he made to me just the other day shows just why the program starts this way. What I noticed was that my son would focus on the lesson, sometimes complaining about not liking a particular shading technique, and then throughout the week as he was just drawing things, he would be using what he had just learned. Sometimes he knew he was doing that, but at other points, I really am not sure he realized he was practicing that week’s lesson. As you work through the course, you move from sketching basic shapes to creating some pretty fantastic drawings. Looking at the lessons at the end of the book is quite overwhelming, but when you take just one lesson at a time and actually learn the concepts being presented, this does build your skills up to the point that those final lessons really are just the next step. One key for me is my teen’s attitude towards drawing now. He just approaches things differently, doing a rough sketch so the perspective is right, and then going back to create detail and nice lines. Before, he’d focus on one area without thinking about how it should fit into the whole, leading to a lot of erasing or just scrapping a project. He’s far happier with his work now. The package says that this is Drawing Success with Jan Bower, Level One. My family is hoping that there will be a Level Two. We will purchase it. "I really like the way this course builds skills sequentially. Students should really learn how to produce very skillful and impressive art work as they progress through the lessons. By teaching incrementally, Bower makes it possible for every student to be successful, even adults who think they have no drawing talent." I recently completed the DVD course Drawing Success with Jan Bower. Since I am retired, I was able to go through the course rather quickly. I was impressed by the way Jan used solid teaching principles—progressing from simple to complex. Years ago, as a child and teenager, I loved art classes. But then life got very busy, and I did not take time for much drawing. However, as I was teaching grades K-3, I often sketched simplistic pictures with silly little stick figures to illustrate lessons. My purpose for taking this course was to develop my skills so I can better illustrate some of these educational fun stories. As I drew pictures along with Jan, I gained a lot of confidence. She made me more aware of basic shapes and shadows. Even her instruction about how to hold the pencil helped me a lot. Although I will never be an artist like Jan, I feel I now have the foundation and skills to draw better pictures to illustrate some picture books and educational materials that I can share with others. Thanks Jan! "I am impressed with your content and delivery." ~ Y.R. (Texas) Thank you for shipping my order so promptly. I have had a chance to look at the books and watch the first two lessons. I have tried several samples from other curriculum and it seems like they are speaking to 5-year-olds or they talk at a college level...or the quality of the video is horrible. I am impressed with your content and delivery! I plan to use your program in a coop setting. My 12 and 14 year old sons are just wrapping up their 7th and 8th grade year and we made "Drawing Success" part of their curriculum this year. I am not an artist at all, yet I wanted to give our boys the opportunity to really enjoy art and not be intimidated by it. I have been completely amazed at Jan's ability to simplify what looks like a very difficult subject and offer my sons the feeling of complete success and pride upon completion! The lessons are easy to follow, easy to understand, and easy to do! It really doesn't get any better than this! There is nothing else like this on the market for anyone 10 years or older! This program offers you the chance to increase your children's self worth by exposing a talent that they perhaps are unaware of. My guys are so proud of every lesson that they complete and honestly I'm shocked at their abilities! I know that they wouldn't feel this sense of accomplishment and pride if it weren't for this awesome curriculum. I owe their success in art to this product. If you're contemplating it, don't waste any more time. Take it from someone who carefully selects curriculum, It is an absolute bargain! I really enjoyed drawing success. I’m 20 and I’ve dabbled in art here and there throughout my life, but I still consider myself a beginner because I could never really grasp the basic foundation. At the beginning, the lady teaches you the correct way to hold your pencil and explains why. I thought this was unnecessary at first, but there were a lot of simple mistakes, with easy fixes, that I had been making all my life that made art exasperating. These easy fixes actually made a huge difference in my drawings. The program started with the fundamentals, but it was never boring or too slow. I enjoyed the progression of the lessons and how each one built off of each other; I would continue to use the techniques that I had learned while working on a different picture in a previous lesson. I used to get so frustrated with art DVD’s because the content of what the person was saying wasn’t very helpful. I remember often thinking, “how did you get it to look like that?! Mine doesn’t look right at all!” But you could tell this lady was a good teacher because she anticipated where I might struggle and gave me very helpful pointers and explanations for tricky parts of my drawing. Now, when I look through my sketch pad, I really can’t believe that I created the pictures that inhabit it. I am so pleased! I highly recommend this product. I’m a junior in college studying marketing and advertising and I wanted to be able to articulate my ideas to my future team with accurate and appealing sketches. I came away with that and more; I actually enjoy drawing now and I don’t get frustrated anymore because I am pleased with what I’ve drawn It is well worth the investment!! I didn't know I could create something so realistic. I learned so much (and not just about art). Your tips and advice were perfect and so encouraging, both about art and glorifying God with my talents. Thank you! My daughter has learned so much, is challenged, and is loving it! I see her using what you're teaching (balance, contrast, composition, etc.) now in her photography. She will use these concepts life-long. Thanks so much! At first I thought this course was overly simplistic, but I didn't want to skip any part of it and I am so glad that I didn't. Things as simple as holding my pencil correctly made such a difference in my ability to draw an oval, circle, or a straight line. I am 82 and have been drawing all my life, and this made such a difference! Also, the step by step approach is very helpful. It's a great course, easy to follow and fun to do.